The FIRM NEW Property Manager coming soon! As you are all aware our previous Head of our Property Management Team has retired and we have been researching other management businesses to fill the gap. We have been constantly on the alert looking for someone who can take over the role. We are in final negotiations now with a very exciting, new age format that is keeping up with the times yet still maintaining our good old fashion service of excellence. It will not be too long before the decision will be made to fill this very important role for the future. In the meantime business as usual with the rest of our team are at your disposal. If your On-Site Management is not performing to your expectations then give us a call. 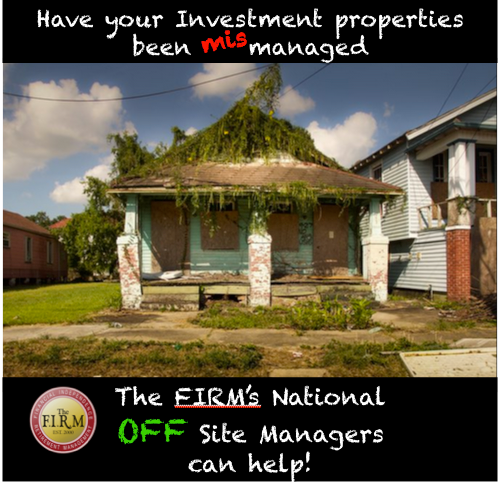 As you would be aware The FIRM and our members as a group have been very frustrated with a few management companies who have no respect for our property investments that they manage. Collectively our corporation as a group would retain 1000's of properties nationally over the past 15 years. Our current Property Management are now retiring from the industry soon so we are seeking a management company who could continue this demanding role. If your corporation would be interested then please contact me direct.